With the aid of our nimble staff, we are supplying best quality of Chemical Bucket. Offered bucket is intricately manufactured keeping in mind the needs of our esteemed clients'. Apart from this, the offered bucket is extensively acknowledged among our esteemed clients FOR its attributes like optimum finish and precise size. 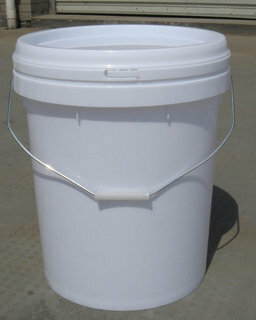 Moreover, we are offering this bucket in different sizes at budget-friendly prices. Gurgle free, controlled flow dispensing spout. Incepted in the year 2013, in Jaipur (Rajasthan, India), we "Poddar Technoplast" are a reckoned Sole Proprietorship firm actively engaged in manufacturing, exporting and supplying an excellent range of Lubricant Bucket, Grease Container, Paint Bucket, Distemper Plastic Bucket, Pesticide Bucket, Chemical Bucket, Zyme Bucket, etc. The offered products are designed using utmost high quality basic material and modern technology in compliance with the set quality standards. Offered products are highly urged for their feature such as durability, lightweight, accurate dimensions and impact resistance. Our quality controllers test the entire array against various quality parameters to avoid any kind of defect. In order to satisfy the specific needs of our clients, we deliver these products in several sizes, shapes and designs.